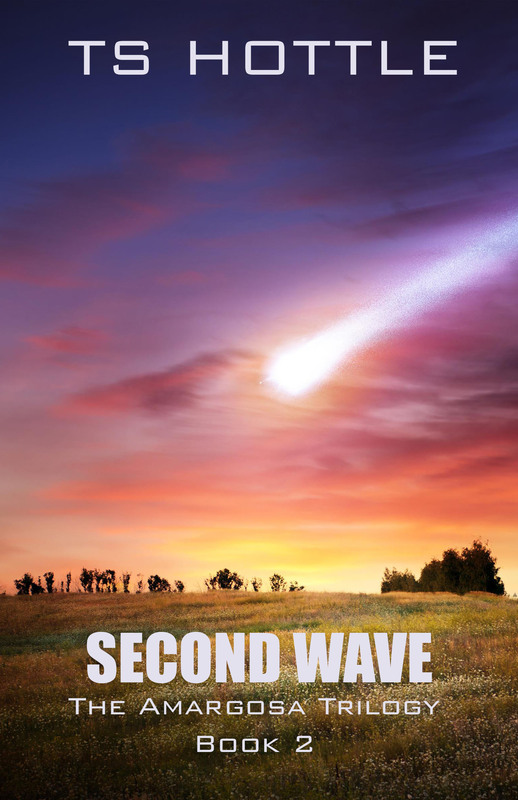 Second Wave is Book 2 of The Amargosa Trilogy. When we first meet JT Austin, he’s a snot-nosed rich kid pretending to be older than he is. His mother leads the largest commercial entity in the Compact. His father is an admiral. When they tire of his antics and threaten him with military school (specifically Virginia Military Institute), he decides to run off to Tian, humanity’s wealthiest world. A prank sends him to Amargosa, a backwater colony of Mars. By the end of Gimme Shelter, he’s under the suspicion of a renegade constable named Kray and in the arms of a farmer’s daughter named Lizzy. Gimme Shelter ends as the Gelt invasion begins. The Children of Amargosa begins with JT and Lizzy running for shelter as the sky explodes and incursion capsules fall from the sky. They are soon swept into the fighting, Lizzy returning to defend the family farm and JT informally drafted into the Colonial Guard. Fleeing into the mountains, they meet up with an early cell in the resistance. Within 24 hours, they marry, are captured by the renegade Kray, and taken under the wing of Suicide, a pilot living in solitude when the Gelt arrive. Lizzy dies saving JT, and JT himself becomes part of the larger resistance. And that is where we find him as Second Wave begins. He is 16 years old, barely an adult under Martian law, but finds himself teaching former office workers and ranch hands twice or three times his age how to shoot and be soldiers. Around his neck hangs a bullet locket with some of Lizzy’s ashes. It reminds him of a promise he made to her before they married. He promised to liberate her family’s farm. He intended to leave Amargosa and bring back help. When the Ban Ki-moon falls from the sky, he sees a chance to keep that promise. And he’s willing to defy the very people he’s come to admire to make that happen.